This project is a moose, not a monster. 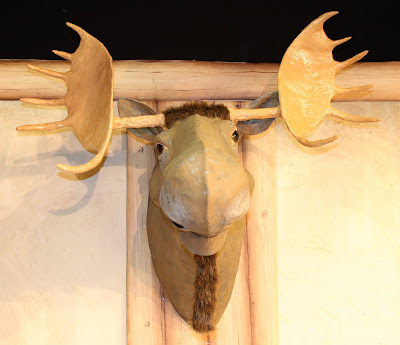 I volunteered to make a moose head trophy for the stage play "Catch Me If You Can" by Weinstock and Gilbert, in which I'm playing Inspector Levine (January 2010). Although there were few surprises it was still a challenging project with several moose-adventures. I started out by tracing a moose silhouette onto cardboard of the size I wanted. After padding the silhouette with plastic bags stuffed with paper to round it out I covered the form with tape, paper and plenty of 'mooscilage'. Bruce is starting to look like a moose (or a cow). The early-stage eyes are visible, resting in the egg carton, above. This was my first project of this size so, naturally, I learned a few things while doing it. Big projects require more drying time so using fans helped tremendously in drying the paper. Looking quite cheerful here with ears attached - clearly inspired by Thalia, the Moose of Comedy. Or is it Muse? Moose is less than life-size. I obtained a length of 3/4" I.D. PVC pipe and made it part of the head. This would later receive the ends of the antlers. The eyes worked out much better than I imagined; they really make it 'come to life'. Eyes were made from foil balls covered with Sculpey (bakeable hobby clay), painted, then given several coats of polyurethane gloss. A face you can trust! Ears were relatively easy - I made forms of coat-hangar wire and stretched white glue soaked bedsheet material across them. A lot of thought and work went into the antlers. Fortunately, each moose's antlers are unique, so I couldn't go wrong on the shape. I finally settled on cardboard ovals with tape and paper-covered wire for the points. 3/4" dowel worked just fine for the horizontal supporting members. These were angle-cut and fastened to the ovals with screws. I covered the antlers with (true) paper mache of a clay-like consistency to give them a pleasing shape and fill in voids. Lots of filing and sandpapering was needed to get the smoothness I wanted. The antlers were then painted, stained and given a gloss coat. The 3/4" dowels of the antlers were inserted into the ends of the PVC. I drilled into Bruce's head from above and secured the antlers with pegs to keep them from rotating. Another consideration was hair. 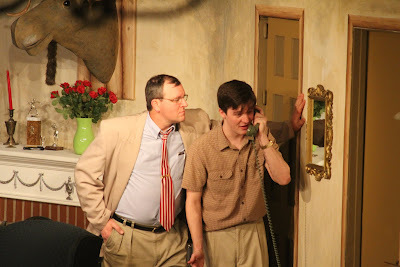 Did I really want to go to the trouble of covering a stage prop with faux hair? Certainly it could be done, but live performance was approaching and I was running out of time! I finally located some fake fur at a hobby shop, but decided to paint Bruce using a base coat then dry-brushing. This looks acceptable from the audience. I covered his pate with fur and gave him a nice, moosculine beard. Voila! Congratulations ma'am, it's a moose! He looks pretty good from 3/4 views, but there's a definite centerline ridge visible from the front. More rounding before papering would be better next time. A friend commented that the antlers are way too small for a moose. Aside from the fact that this was a stage prop, he's probably right. Next time, more moosive antlers! Annette, that Inspector Levine's back. Check out his moooose! "So that's that, and that'll be that, and that's the end of that!" Inspector Levine, "Catch Me If You Can"